Owing to the broad range of applications of ozone (systemic or local, gaseous or as a solution), ozone treatment is effective in many ailments and diseases. 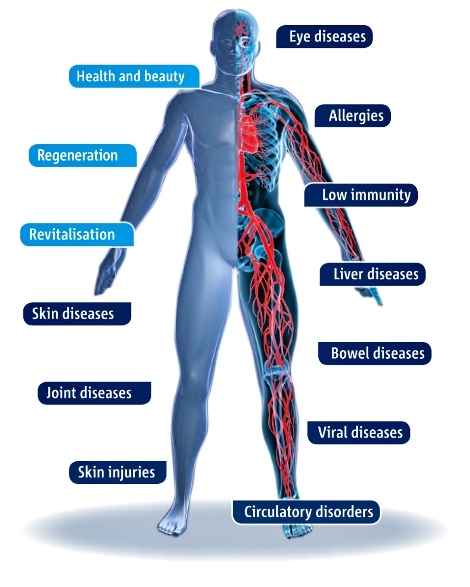 Vascular diseases, immune diseases and geriatric diseases are the classic indications for ozone therapy. For the treatment of skin diseases and injuries, allergies, infections as well as for prevention and regeneration ozone is used in many countries. Ozone therapy can be used as an independent, alternative healing method or as a supplement to school medicine - for the healing and maintenance and improvement of the quality of life.